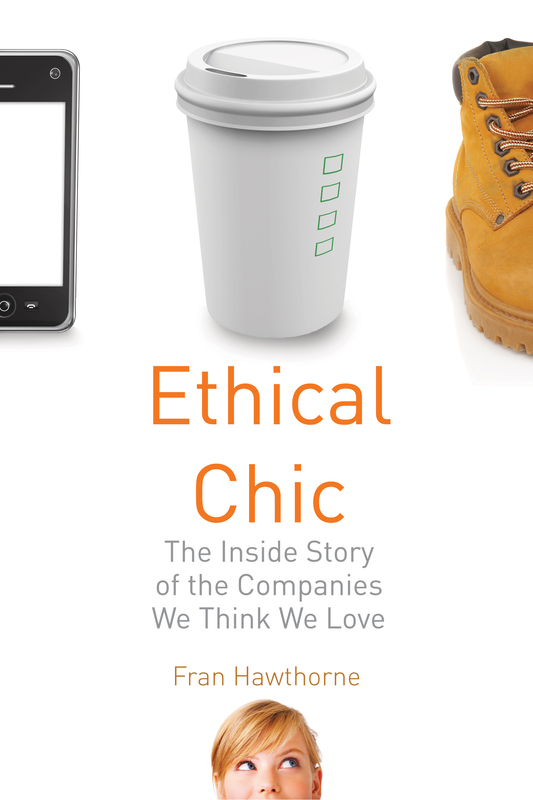 Following is an excerpt from Fran Hawthorne’s latest book, Ethical Chic. Elizabeth MacBride interviewed her in How To Build Time For A Book Without Losing Your Freelance Chops. Company Y, on the other hand, is a terrible company for progressives. Its nonunion employees historically labored long hours at the whim of a micromanaging chief executive who changed his mind at the last minute and made impossible demands. Overseas, it uses Chinese sweatshops so dreadful that a dozen workers have committed suicide. It has been slow on environmental issues, acting only after intense prodding by socially responsible mutual funds and a big public campaign from Greenpeace. Actually, it’s hard to know anything about this company, because it’s so secretive that its press people don’t return phone calls. In this age of consumer activism, pinpoint marketing, and unlimited and immediate information, we want the impossible: products and producers that will assure us that we are fashionable, and that also don’t pollute, don’t harm animals, don’t contain weird chemicals, run on alternative energy, pay their workers good salaries, recycle their scraps, use natural ingredients, buy from local suppliers, donate generously to charity, donate in particular to their neighborhoods, and don’t throw their weight around by lobbying. (Or maybe they should lobby for “good” causes?) Why should we pay good money for something that will make us look nerdy, or that will poison the Earth? We don’t think we’re being overly demanding. All we’re asking for are the kinds of policies we try to follow in our own daily lives, and if we can manage to recycle and avoid animal products, then certainly big companies, with all their clout, can do likewise. Hard as it is to be so many things to so many consumers, a handful of companies and products—like Apple, Ben & Jerry’s ice cream, Converse sneakers, and the grocery chain Trader Joe’s—seem to have hit that magic bull’s-eye, at least for a time. Almost no matter what they do, they maintain an image of being cool, fun, and innovative and, at the same time, an equally strong image as green, politically progressive, and ethical. As a result, their customers are fiercely loyal. At Macworld, the annual conference for users and vendors of Apple products in San Francisco in 2010, I met fans who had traveled at their own expense from as far away as Iowa, Illinois, and Michigan just to meet kindred souls and to ooh and ahh over the newest add-ons. And mind you, this was a gathering without the magical presence of Apple’s legendary cofounder, Steve Jobs. Meanwhile, Naomi A. Gardberg, an assistant professor at the City University of New York’s Zicklin School of Business, has friends who will drive thirty miles to get to Trader Joe’s. Even during the 2008–2009 downturn and the weak recovery afterward, BusinessWeek magazine noted in amazement that stressed-out, debt-ridden, mortgage-foreclosed consumers still found spare change (or unused credit lines) for Apple iPads and Starbucks lattes. They would forgo a new car, switch from brand-name to generic toiletries, and pick up shampoo at discount outlets, the magazine said in an August 2010 cover story. But Apple and Starbucks were irreplaceable. In return, more and more business executives are recognizing that ethical-trendy shoppers are a big and growing market. While the desire to be trendy is nothing new, the other factor—what’s often called corporate social responsibility, or CSR—has burgeoned more recently. All this may seem a lot to require of one pair of boots, one cup of coffee, or one company: Is it possible for a product to be both trendy and socially responsible? To be trusted and also loved? Yes, a few companies like Apple and Trader Joe’s seem to have earned that double halo, but are they the exceptions? This book set out to analyze six candidates, although they’re hardly the sole companies in the world that might fit the dual definition. For that matter, the lessons here could be useful to any business. The driving idea is to understand how these privileged companies operate, what customers and activists say about them, why they are viewed as ethical and cool, what they do to try to achieve those images—and whether, in the end, they deserve their reputations. Excerpted from Ethical Chic: the Inside Story of the Companies We Think We Love, by Fran Hawthorne (Beacon Press, 2012). Reprinted with permission from Beacon Press.